Congratulations! Your baby is now at six weeks! In the early stages of pregnancy, you may have many questions. What size is my baby? Is she or he healthy? How does she or he look? The good news is that you don't have to wait that long to discover some of these answers. They can be uncovered during the six week ultrasound. An ultrasound is an image created by a special machine that allows you to see a baby inside the womb. It can tell you a lot about your growing baby, including its size, heart rate, the status of your baby's organs, and how far along you are in the pregnancy. The six week ultrasound is a very important event, as you may be able to detect your baby's faint heartbeat. What can you see at week six? At six weeks, your baby will be smaller than a raisin, about less than an inch. Despite its small size, your baby's ears, mouth, and nose are starting to develop. The six week ultrasound will reveal a large head with dark spots. These dark spots are the beginnings of your baby's beautiful eyes and cute nose. The ears will look like two tiny depressions on the head. 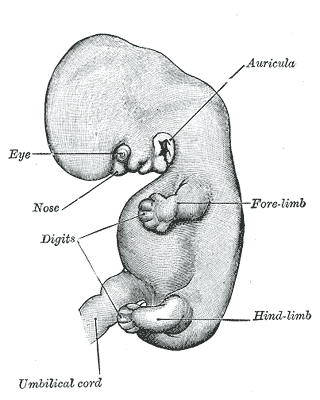 Protruding out of the small mass will also be tiny buds; these are the start of your baby's arms and legs. Your baby's heart is forming and beginning to beat. The heartbeat will be around 100-160 beats per minute and blood is beginning to flow through his or her forming body. Internally the baby's intestines, lungs, pituitary gland, brain, bones, and muscles are beginning to form. The spinal cord, which was closed for the last few weeks, is now closing up. 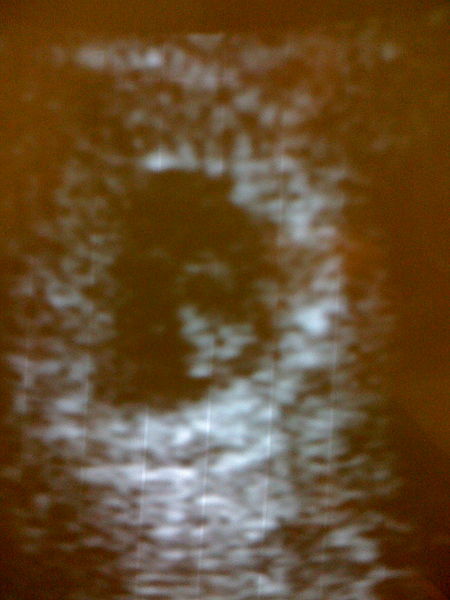 You will be able to see this on the ultrasound as a long tail-like structure. The brain, which was previously a large mass, is beginning to segregate into five separate domains. The above information is what can be typically seen at the six week ultrasound, but there may be slight differences. Every woman is different, so not every pregnancy will follow a definite path. The above information should only be taken as a general overview. Women may experience differences due to certain health issues or a mere miscalculation for ovulation. A woman may take her gestational age to be the age of her baby. The gestational age of a pregnancy is counted from your last normal period, whereas the fetal age is the age of the forming baby. Pregnant women should always take the time to have an ultrasound in their sixth week. It is quite important as many developmental stages can be seen, such as the baby's heartbeat. However, it is important to note that you may not see everything that we have listed, as every pregnancy is different.